What’s new in ElectricAccelerator 6.2? Rules with multiple outputs? Yeah, we can do that. Every now and then, makefile authors need to write a single makefile rule that produces more than one output file, to accomodate tools that don’t fit gmake’s rigid one-command-one-output model. The classic example is bison, which produces both a C file and a header file from a single invocation of the tool. Unfortunately in regular gmake the only way to write a rule with multiple outputs is to use a pattern rule. That’s great — if your needs happens to dovetail with the caveats and limitations of pattern rules (chiefly, that the output files share a common base name). If not, the answer has been basically that you’re out of luck. There are a variety of kludges that approximate the behavior, but despite numerous requests over the last decade (1, 2, 3, 4, 5, 6, 7, 8) and at least one patch implementing the feature, GNU make (as of 3.82) still has no way to create an explicit rule that produces multiple outputs. GNU make interprets this construct as two independent rules, one for foo and one for bar, which happen to each create both files. Thanks to the #pragma multi designation, Electric Make will interpret this as a single rule which produces both foo and bar. Using a #pragma to flag the rule is perfect, because it sidesteps any questions about syntax changes. And since #pragma starts with a #, GNU make will treat it as a comment, so this makefile will still be usable with GNU make — you’ll just get correct behavior and better performance with Electric Make. In addition, Accelerator 6.2 is expected to work correctly on both Ubuntu 12.10 and Windows 8, although we cannot officially claim support for those platforms since they were themselves not finalized at the time Accelerator 6.2 was released. This release also incorporates enhancements to the Linux installer which make the installation process about 25% faster compared to previous releases. A complete list of platforms supported by ElectricAccelerator 6.2 can be found in the Electric Cloud Knowledge Base. That error shows up sometimes when your build starts background processes — kind of a distributed build anti-pattern itself, but unfortunately it’s not always something you can control thanks to some third-party toolchains. Or rather, that error used to show up sometimes, because in Accelerator 6.2 we’ve bulletproofed the system against such rogue background processes, so that error is a thing of the past (nota bene: this enhancement is not available on Solaris). In addition, we bulletproofed the system against external processes (any process running on an agent host which is not part of your build) accessing the EFS. In certain rare circumstances, such accesses could lead to agent host instability. With 6.2 out the door we’ve finally got bandwidth to work on 7.0, which will focus on some very exciting performance improvements, especially for incremental builds. It’s a little bit too early to share any of the preliminary results we’re seeing, but rest assured — if you thought Accelerator was fast before, well… you ain’t seen nothing yet! Stay tuned for more information. ElectricAccelerator 6.2 is available immediately. If you are already an Accelerator user, contact support@electric-cloud.com to upgrade. If you are not currently a user, you can download a free evaluation version of ElectricAccelerator Developer Edition, or contact sales@electric-cloud.com. Parallel execution is a popular technique for reducing software build length, and for good reason. These days, multi-core computers have become standard — even my laptop has four cores — so there’s horsepower to spare. And it’s “falling over easy” to implement: just slap a “-j” onto your make command-line, sit back and enjoy the benefits of a build that’s 2, 3 or 4 times faster than it used to be. Sounds great! But then, inevitably, invariably, you run into parallel build problems: incomplete dependencies in your makefiles, tools that don’t adequately uniquify their temp file names, and any of a host of other things that introduce race conditions into your parallel build. Sometimes everything works great, and you get a nice, fast, correct build. Other times, your build blows up in spectacular fashion. And then there are the builds that appear to succeed, but in fact generate bogus outputs, because some command ran too early and used files generated in a previous instead of the current build. This is precisely the problem ElectricMake was created to solve — it gives you fast, reliable parallel builds, regardless of how (im)perfect your makefiles and tools are. If the build works serially, it will work with ElectricMake, but faster. If you’ve worked with parallel builds for any length of time, you can probably appreciate the benefit of that guarantee. The prize for this reliability? Faster builds, because you can safely exploit more parallelism. Where gmake becomes unreliable with -j 3 or -j 4, emake is reliable with any number of parallel jobs. The technology that enables emake to ensure reliable parallel builds is called conflict detection. Although there are many nuances to its implementation, the concept is simple. First, track every modification to every file accessed by the build as a distinct version of the file. Then, for each job run during the build, track the files used and verify that the job accessed the same versions it would have had the build run serially. Any mismatch is considered a conflict. The offending job is discarded along with any filesystem modifications it made, and the job is rerun to obtain the correct result. 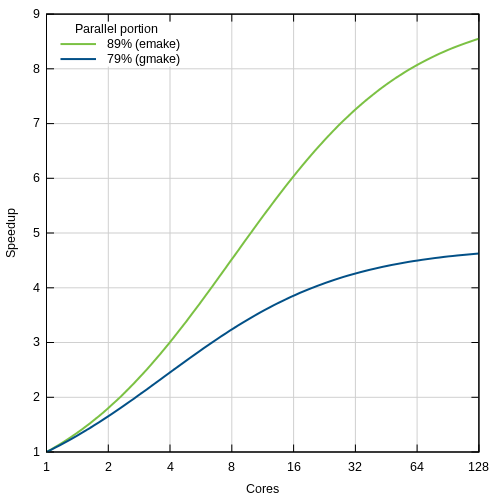 Jobs are the basic unit of work in emake. A job represents all the commands that must be run in order to build a single makefile target. In addition, every job has a serial order — the order in which the job would have run, had the build been run serially. The serial order of a job is dictated by the dependencies and structure of the makefiles that make up the build. Note that for a given build, the serial order is deterministic and unambiguous — even if the dependencies are incomplete, there is exactly one order for the jobs when the build is run serially. With the serial order for every job in hand, deciding which file version should be used by a given job is simple: just find the version created by the job with the greatest serial order that precedes the job accessing the file. 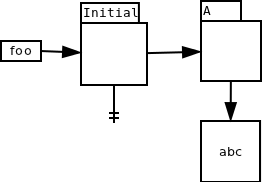 For example, using the version chain above (and assuming that the jobs’ names reflect their serial order), job B should use the version created by job A, while job D should see the file as non-existent, thanks to the version created by job C.
A job enters the completed state once all of its commands have been executed. At that point, any filesystem updates created by the job are integrated into the versioned filesystem, but, critically, they are not pushed to the real filesystem — that gives emake the ability to discard the updates if the job is later found to have conflicts. Each job runs against a virtual filesystem called the Electric File System (EFS), rather than the real filesystem. The EFS serves several important functions: first, it is the means by which emake tracks file accesses. Second, it enables commands in the build to access file versions that exist in the versioned filesystem, but not yet on the real filesystem. Finally, it isolates simultaneously running jobs from one another, eliminating the possibility of crosstalk between commands. 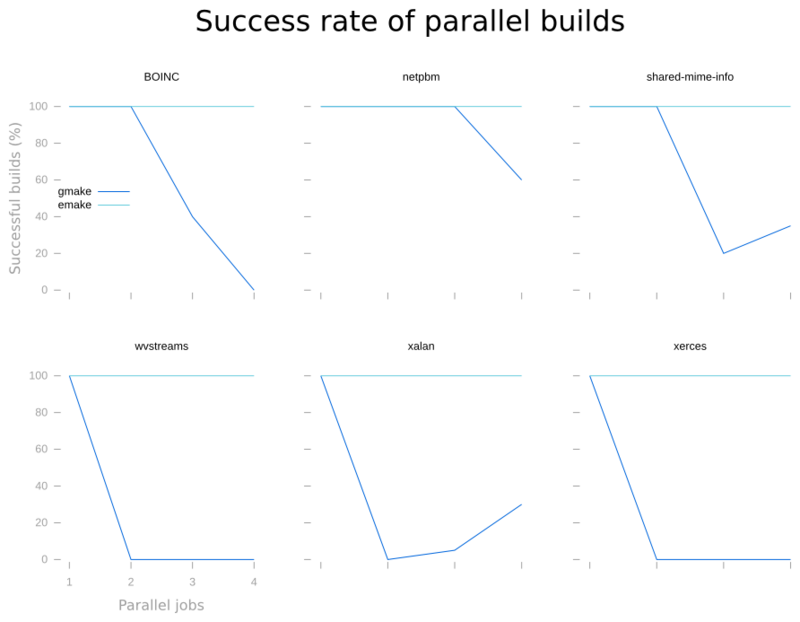 Since job A precedes job B in serial order, the version created by job A is the correct serial version for job B. Therefore, job B has a conflict. If a job is determined to be free of conflicts, the job is committed, meaning any filesystem updates are at last applied to the real filesystem. Any job that has a conflict is reverted — all versions created by the job are marked invalid, so subsequent jobs will not use them. The conflict job is then rerun in order to generate the correct result. The rerun job is committed immediately upon completion. Conflict checks are carried out by a dedicated thread which inspects each job in strict serial order. That guarantees that a job is not checked for conflicts until after every job that precedes it in serial order has been successfully verified free of conflicts — without this guarantee, we can’t be sure that we know the correct serial version for files accessed by the job. Similarly, this ensures that the rerun job, if any, will use the correct serial versions for all files — so the rerun job is sure to be conflict free. Conceptually, conflict detection is simple — keep track of every version of every file used in a build, then verify that each job used the correct version — but there are many details to its implementation. And in this article I’ve only covered the most basic implementation of conflict detection — after many years of experience and thousands of real-world builds we’ve tweaked the implementation, relaxing the simple definition of a conflict in specific cases in order to improve performance. The benefit of conflict detection is simple too: reliable parallel builds, which in turn means shorter build times, regardless of how imperfect your makefiles are and how parallel-unsafe your toolchain may be.